What Is a Word Wall? A wall with words on it, right? Yes, and so much more. Do you dream of a learning resource that makes your classroom look more academic, inviting, and kid friendly, even as it helps students become more independent? A word wall could be just what you’re looking for! A word wall is just that—a wall dedicated to displaying high frequency words (these could be sight words or words that are used a lot in your class) that are important for your students to know and use. In early elementary classrooms, these are words that children are learning to read and write. In upper grade classrooms, these can be words related to concepts and topics that students are learning about. You could have a word wall about math that incorporates math definitions and symbols. Or, a science wall that, over the course of a unit, gets filled with biomes and animals that live in each. You’ll know you have a successful word wall when students use it daily to find just the right word when they’re reading or writing. Why use a word wall? Make words concrete for young learners as they find words on the word wall using their finger or a pointer. 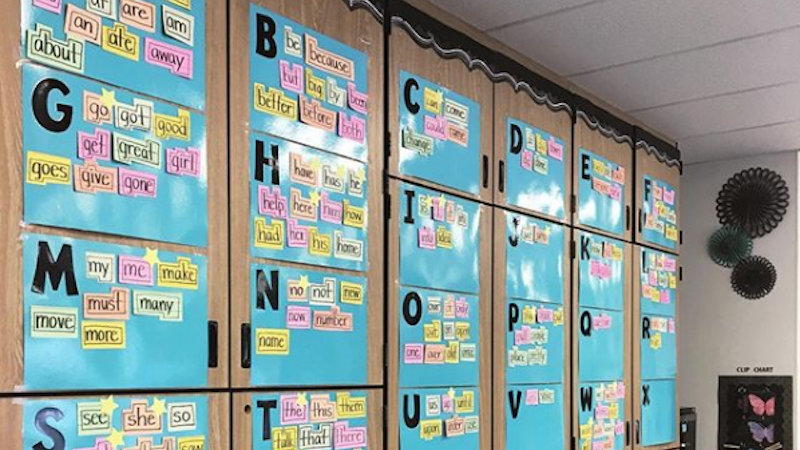 Expanding student vocabulary by helping students see how words connect, as in a word wall that displays lists of synonyms. How do I make a good word wall? 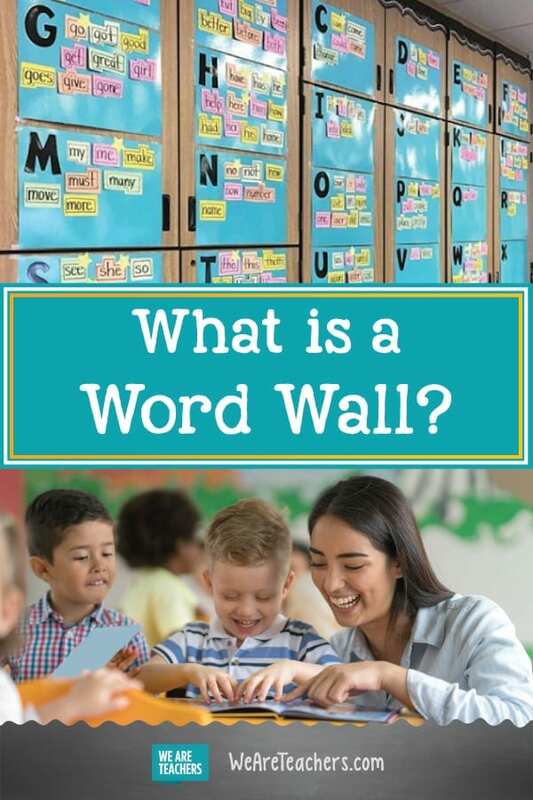 Place the word wall in an area of the classroom that is visible and accessible and use a dark background to make the words stand out. Organize high frequency words in alphabetical order to support students’ knowledge of the alphabetic principle. Organize other words walls that display vocabulary words, synonyms, or other concepts in a way that helps students see how the words connect or in a way that makes the most sense for student use. For example, a list of science terms may be listed in alphabetical order, while words used during reading may be organized by prefix. 3×5 note cards are a good size to post (you’ll fit a lot on one wall, and they are big enough to be read from a distance). Use different colors to add another reference point for students. If they ask about a word, you can direct them to the “pink card under the L.” Writing words on different color cards also helps children distinguish similar words. This seems obvious, but write in large dark letters, again, so the words are easy to see from anywhere in the classroom. Insider tip: Keep the materials (3×5 note cards, black marker, tape) that you’ll use to create a word handy, so you can make and add words to the word wall during a lesson. Students may even suggest words that they want added to the wall as you teach. Okay, my word wall is up. Now, how do I use it? First, don’t overdo it. Teach three to five new words each week. Teach children how to use the word wall. Model how to use the word wall to find and spell words during writing or how to “read around the room” using a pointer or their finger to read the words on the wall. Use the word wall each day. Incorporate words that are already on the wall into daily activities, like word sorts, word ladders, and word practice. In addition to high frequency words, add words that are content specific. The more relevant the words are to students’ experience, the more they’ll be used and the faster students will learn to read and write them. Even pulling words from the school song and incorporating those into the word wall is a great way to generate words for the wall. Spend a few minutes each day playing a word wall game, like bingo or charades. Each time a student asks about a word that is on the word wall (“How do you spell … ?”) create and use a hand signal (maybe use the American Sign Language signs for “word” and “wall”) that refers them to the word wall. After all, the whole point is that they’ll use it on their own. I already have a word wall; how do I take it to the next level? Use Velcro or sticky tack to make the words removable so students can take the word they need to their desk for reference. Or, write the words on the back of envelopes. Put that note cards, with the word written on each, inside the envelope. Then, post the envelope and let students select a note card for reference when they need it. Add a new word to the wall for a period of time and have students hunt for this visiting word. Then, see if they can use the visiting word in their writing and discussion. Challenge students to write a story (or article) using as many words from the word wall as they can. How to set up your literacy space so that it focuses on literacy skills and content (word walls are one of them). Inspiration for word walls that are works of art. Come and share your word wall ideas in our WeAreTeachers HELPLINE group on Facebook. Plus, check out vocabulary ideas that make words stick. Samantha Cleaver, PhD, teaches middle school special education and writes about her favorite thing to do, reading.